Want to book Ashby Concert Band for your next fund-raising concert? Would you like to become a Patron of Ashby Concert Band? Since its formation in 1996, Ashby Concert Band has grown to become one of the foremost concert bands in the East Midlands, with over 50 committed and enthusiastic woodwind, brass and percussion players. Through a regular programme of high quality concerts in Ashby and other venues throughout the East Midlands the Band entertains its audiences through a wide musical repertoire, including classics, original works for bands, film music and music from the musicals. The Band has also undertaken two visits to Pithiviers, Ashby's twin town in France, and has also toured the Black Forest region of Germany. 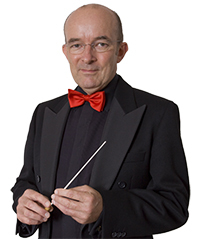 Adrian Ashton has been Director of Music of Ashby Concert Band since 1999. Adrian joined the Band originally as a playing member, where he occupied the seat of 1st Alto Saxophone player. However, in 1999 he assumed the role of Director of Music and brought with him a wealth of experience amassed in over 40 years of music making. Whether it be music from the classical genre, the music of the movies or the musicals, or high quality original works for band, Adrian is keen to develop the band in terms of its musical repertoire and appeal to audiences.